Ustinov is an exceptional type coupled with a mouthwatering pedigree to match. His dam the Champion mare Let’s Elope (Melbourne Cup winner, Australian horse of the year and co-champion older horse in Australasia, hall of fame inductee) and sired by one of the best sire’s in the United States, Seeking The Gold who happens to be one of the greatest son’s of Mr Prospector earning over 2.3million during his racing career and has sired progeny with collective earnings of more than 92 million. 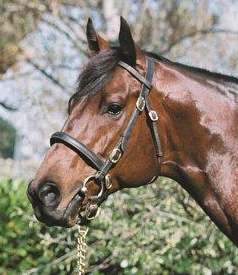 His progeny have earning of close to 4million in prize money. He boasts 53% runners to winner’s ratio. USTINOV’s impeccable pedigree allows breeders to tap into the bloodlines of Seeking the Gold (Mr Prospector) and Nassipour (Blushing Groom) sire of champion Melbourne Cup Winning mare Let’s Elope. These bloodlines are simply the best match for Danzig/Danehill lines that are so prevalent in Australia today. There is also the option of doubling up on the Mr Prospector strain which also works well. USTINOV was an outstanding racehorse winning the group 2 MVRC AAMI Vase and was group 1 placed second behind Lonhro in the MRC Caulfield Guinness. At 2 he was second in the AGC Champagne stakes. USTINOV earned over $650,000 in prize money during his career. 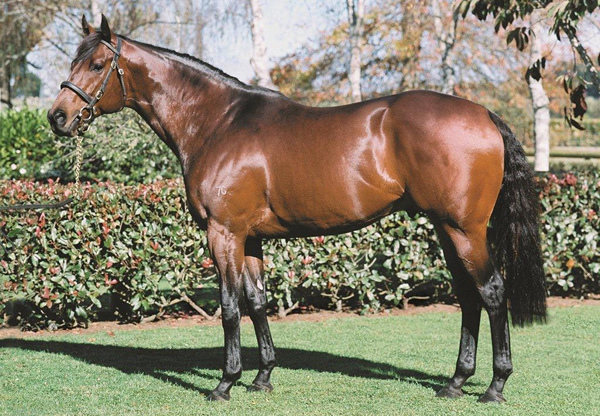 USTINOV’s progeny are versatile and have been winning from 1000m to middle distance. His progeny inherit his beautiful looks and his wonderful temperament. 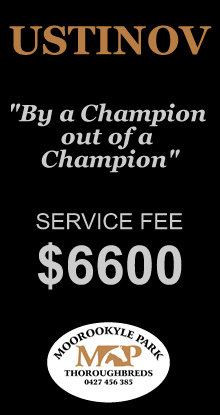 Call to discuss special offers and deals for multiple bookings. Early bird bookings and payments attract discounts.